Today we can’t help but wonder if online privacy is a mythical creature that lived in days long passed, back at the dawn of the Internet. We are all used to being tracked, monitored, and ad-bombarded. Our personal data including online activities, interactions, images and contact details are being collected carefully thanks to diligent machines and crawling bots and kept on file for even longer than our own memory could hold on to. We take this environment for granted. We think that this is the price to pay for having the world’s knowledge database at a click distance. Truth is we pay a hefty price for our curiosity and online surfing and we don’t even realize it. We sacrifice our privacy which in days of unperceivable technology growth has face value of 0. What we tend to perceive as tools for filtering and accessing online data end up using us for accumulating fortunes. Search engines are our gateway to the endless online library, but they also pose a threat to our privacy that we need not to ignore. There are few search engines that embrace the privacy safeguarding concept as their credo and don’t track their users, but are they the ones we want to use? Let’s try to answer the above questions by comparing the most prominent search engine offering personalized search results – Google and his less popular alternative – the private search engine DuckDuckGo. 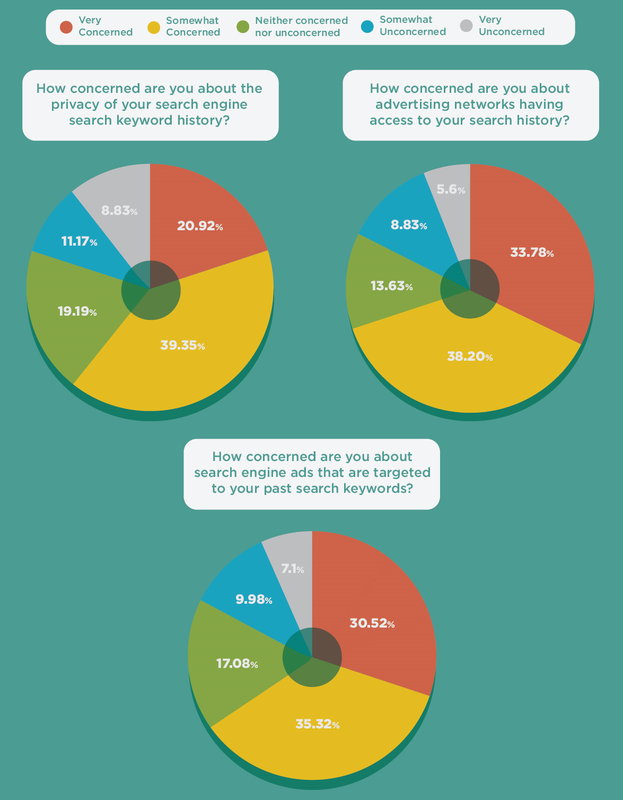 Before we draw the line between the two search engines, let’s see what the major predisposition of the online users is towards online privacy and search engines (survey data available thanks to SurveyMonkey). As you can see from the pie charts above, the typical online user is seriously concerned with their data being shared with advertising agencies. Gradually the online privacy awareness becomes a hot topic that many try to address. But what is actually the mechanism of this data leak, you’d ask. It’s easy: search engines that offer highly personalized results have to be able to base that process of personalization on solid facts. In order to get hold of those they have to play the role of a detective and do some research on your persona. Personalized search engines gather all sorts of info about your search history, the type of device you use to access the search engine, your location, personal profile, your interests, hobbies, friends, travels, favorite images, videos, etc. Google for instance integrates the data collected through all its products (Gmail, G+, YouTube, etc.) and drafts a pretty thick profile on each of its users. This info is then used to draft special sets of search results that are custom for each user and that directly correspond to the user’s preferred media/authors/topics, etc. (at least according to what the search engine “perceives” as the user’s preferred sources of info). The key is that such loads of personal data could be a real golden mine, and search engines know it. They share the collected data with ad agencies and as a result you get to endure stalking ads throughout the whole web. Imagine you’ve searched for a “PMS relief” as to help your mom find the best solution to her temporary indisposition and you end up watching the same “Premsyn” ad on each site you ever visit. 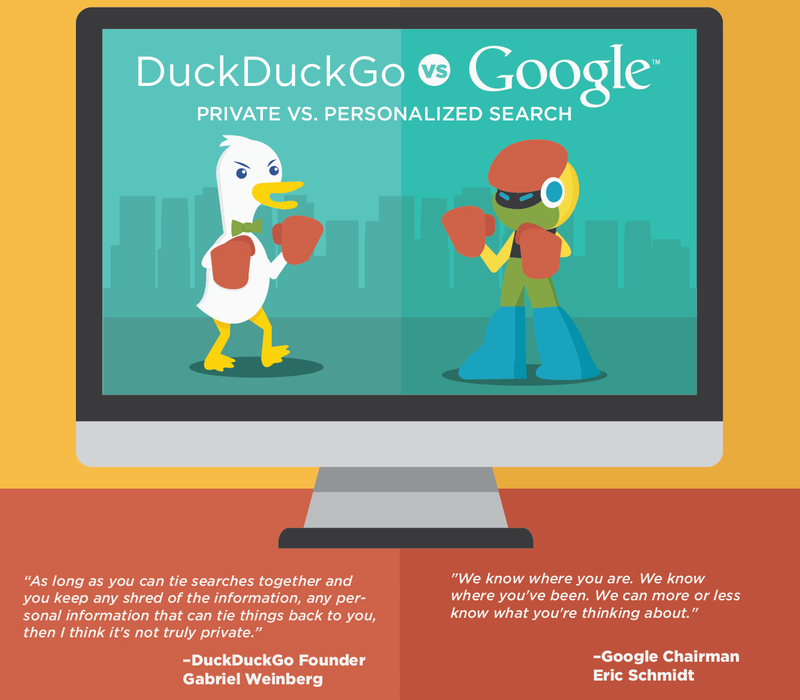 In order to compare both private and personalized search engines, namely DuckDuckGo and Google; we are to see their key disadvantages. 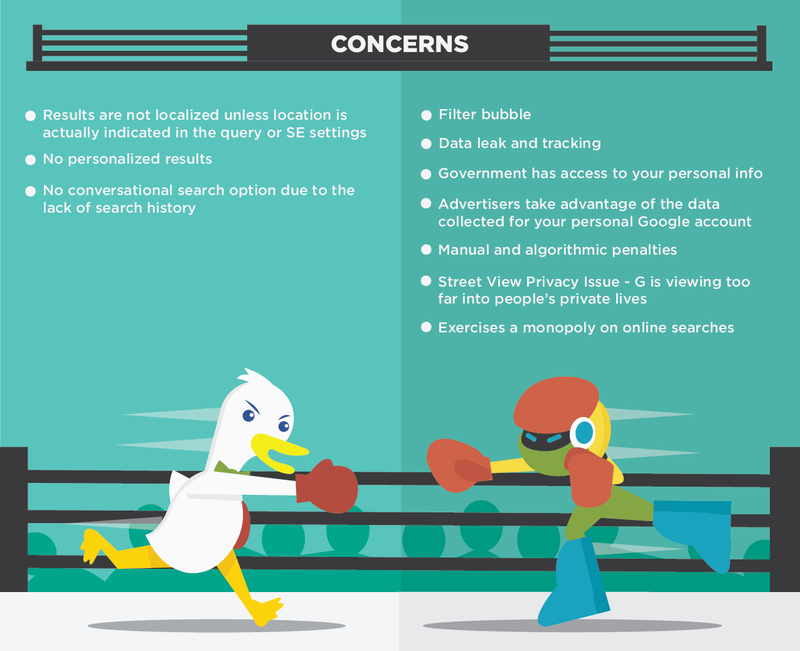 What are the concerns that the use of either Google or DuckDuckGo raise in terms of privacy? Filter bubble – the concept refers to limiting the user’s exposure to a defined set of results that the search engine considers “relevant” to its profile. This improvised filter has the potential to artificially shape one’s world view. The given user will be presented with info that is extracted from its favorite news or blog sources, thus the user will view a skewed version of the net and will hardly have access to stories that represent an opinion different from his own. Government has access to your personal info – in 2012 Google gave NSA access to all its user accounts, including their audio&video files, emails, documents, connection logs, etc. Advertisers have access to your personal info – as previously discussed, Google shares its users’ profile data to its partners, in this case advertising agencies that wish to promote their products/services to targeted audiences. Street View Privacy Issue focuses on the concern that Google is viewing too far into people’s lives. Non-localized results – given that DDG does’t track the IP, GPS coordinates and any other parameters to profile its users, it renders results that are the same for each user regardless of its current location. If one wishes to see local results, he is to add a location descriptor to its search query. No personalized results – when a search engine is not building a profile on its users, it is impossible to draft special set of results that fit their distinct needs. As mentioned above all users have access to the same set of results for a defined search query. No conversational search – a typical search mechanism in Google, yet impossible to be applied in DuckDuckGo. Conversational search stands for a search engine remembering the previous search queries of its users and perceiving them to be related to its current queries. For instance if type in Google “Who is Anthony Hopkins” and on your second search you type: “How old is he”, Google should be able to connect the two searches and understand whom you’re referring to. Given that DuckDuckGo does not record the history of your searches this feature is not part of the search experience it offers. In the end it is up to you to decide which type of search best fits for your needs: the personalized or the private one. Whatever search engine you select for web browsing you’d use it with confidence because you’ve made an educated decision based on true understanding of what are the pros and cons of the two alternatives. Safe browsing! May I suggest https://www.qwant.com/ which main focus is privacy. Hi Nevyana, I was wondering if there is anything that average internet users and casual surfers can do to protect their privacy from search engines. Will surfing in ‘New private window mode’ in Firefox and similar in other browsers can help?